Nasrallah to EU: Why not brand IDF as terror group? VIDEO - Two days after the EU classified Hezbollah's military wing as a terror organization, the Shiite group's leader, Hassan Nasrallah has demanded to know why the 28-nation bloc failed to recognize the IDF as a terror organization. "Europe has succumbed to pressure; it has not been truly convinced" that Hezbollah is a terror organization," the Lebanese group's secretary general said in a speech at the end of Wednesday's Ramadan fast. In a televised speech to the women of the organization, Nasrallah commented on the EU's decision for the first time, saying: "The decision did not surprise us, we had anticipated it for some time. We were even surprised it took so long." "The Israelis clearly stated that the decision was a result of their diplomatic efforts. It is clear that for them, this is a big victory and cause for joy." Hezbollah's secretary general wondered why Israel itself was not added to the dubious list: "Why don't you classify the State of Israel as a terror state? Why don't you classify Israel's military wing, the IDF, as a terror organization if you recognize Israel is occupying Arab lands and refuses to implement international decisions for decades now? The entire world bares witness to the massacres perpetrated by Israel." He also pointed a finger at Washington, as well as at Jerusalem: "Israel and the US invested a lot in exerting pressure on Europe to embrace this position," Nasrallah said, adding that the move serves only Israel's interests. According to him, the EU's decision harms Lebanon as much as it does Hezbollah and it infringes on Europe's sovereignty, interests and principles. "The (EU) countries have harmed their own interests and sovereignty when they succumbed to Israeli and US pressure. They have granted Israel legal legitimacy in all its future wars against Lebanon, because now Israel can claim it is fighting a war on terror. "These countries have thus become full partners in Israel's ongoing belligerence against Lebanon, against Hezbollah and against every stronghold of resistance in Lebanon." He thanked those who continue to support the group: "As is our tradition as part of the resistance, we need to thank all those who denounced the decision, and there are many of those in Lebanon who support us… much like they did during the Second Lebanon War, when we were attacked." The terror group's leader also commented on the possible economic ramifications of the decision, which could lead to economic sanctions being enacted against the organization. "We have no economic enterprises or investments either within Lebanon or outside of it. The decision has no implications in this regard. "We call on the EU to retract its decision for its own sake. Those who think that a meaningless decision will subdue us are delusional." Some European countries had pushed for the EU action by citing a terrorist attack in Bulgaria's Black Sea resort of Burgas last year that killed five Israeli tourists and a Bulgarian. Hezbollah's military wing was accused of involvement, an allegation it denied. In March, a criminal court in Cyprus found a Hezbollah member guilty of helping to plan attacks on Israelis on the Mediterranean island. Both Bulgaria and Cyprus are EU members. Several EU nations have pointed to Hezbollah's involvement in Syria as further reason for the move. The blacklisting entails asset freezes and paves the way for possible travel bans on members of Hezbollah's military wing. The EU ministers hope it will also curtail fundraising. 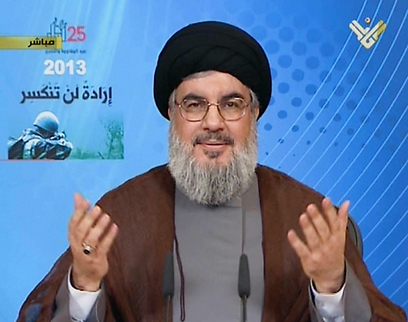 See all talkbacks "Nasrallah to EU: Why not brand IDF as terror group?"